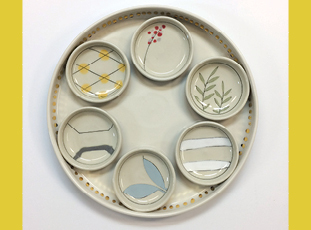 Starting March 1, 2018 you can purchase a custom limited-edition Seder Plate, a special commission created expressly for Heights Arts by Amy Halko, a studio potter residing in Cleveland Heights. Halko teaches ceramics at Cleveland Institute of Art and Cuyahoga Community College. Her work is in several collections and shown nationally. She holds a BFA in Ceramics and Drawing from Bowling Green State University and an MFA in Ceramics from The Ohio State University. Heights Arts Judaica special commissions are in partnerships with both the Mandel Jewish Community Center and the National Council of Jewish Women/Cleveland. Members of those organizations will also receive our 10% Heights Arts membership discount on the purchase of any of these four select items.